Abstract. Impaired angiogenesis and decreased vascular endothelial growth factor (VEGF) expression were recently documented in the remnant kidney (RK) model of progressive renal failure. VEGF (50 μg/kg, twice daily) was administered to RK rats between weeks 4 and 8 after surgery, and rats were euthanized at week 8 for histologic study. During the administration of VEGF (n = 7) or vehicle (n = 6), systemic BP was comparable in the two groups. VEGF treatment resulted in improved renal function and lower mortality rates, compared with the vehicle-treated group. Renal histologic analyses confirmed a 3.5-fold increase in glomerular endothelial cell proliferation (0.14 ± 0.03 versus 0.04 ± 0.02 proliferating endothelial cells/glomerulus, VEGF versus vehicle, P < 0.05), a twofold increase in peritubular capillary endothelial cell proliferation (1.60 ± 0.30 versus 0.78 ± 0.17 cells/mm2, VEGF versus vehicle, P < 0.01), a threefold decrease in peritubular capillary rarefaction (P < 0.01), and a twofold increase in endothelial nitrix oxide synthase expression (P < 0.05) in the VEGF-treated group; an eightfold increase in urinary nitrate/nitrite levels (P < 0.05) was also noted. Although the difference in glomerulosclerosis scores did not reach statistical significance (0.67 ± 0.42 versus 1.22 ± 0.63, VEGF versus vehicle; range, 0 to 4; P = NS), VEGF-treated rats exhibited less interstitial collagen type III deposition (9.32 ± 3.26 versus 17.45 ± 7.50%, VEGF versus vehicle, P < 0.01) and reduced tubular epithelial cell injury, as manifested by osteopontin expression (5.57 ± 1.60 versus 9.58 ± 3.45%, VEGF versus vehicle, P < 0.01). In conclusion, VEGF treatment reduces fibrosis and stabilizes renal function in the RK model. The use of angiogenic factors may represent a new approach to the treatment of kidney disease. Progressive renal disease is characterized by the development of progressive glomerulosclerosis and interstitial fibrosis (1). Although many studies have focused on the mechanisms underlying excessive deposition of glomerular and tubulointerstitial extracellular matrix, there is also evidence of a vascular component being involved in the pathogenesis of renal scarring. For example, focal segmental glomerulosclerosis, which is characterized by podocyte hypertrophy, mesangial expansion, and matrix deposition, also exhibits focal obliteration of capillary loops within the glomerular tuft (2). Progressive interstitial fibrosis is also associated with the loss of peritubular capillaries (3), which would be expected to result in chronic ischemia and hypoxia that could stimulate the scarring process (4). Recently, our group and others documented the loss of both glomerular and peritubular capillaries in experimental models of progressive renal disease (5,6,7). The endothelial cell loss in these models is attributable to both increased cell death (apoptosis) and decreased capillary repair. The reduced capillary repair is associated with impaired endothelial cell proliferation, which seems to be related to significant alterations in the local expression of critically important factors such as vascular endothelial growth factor (VEGF) and thrombospondin-1 (TSP-1), which stimulate and antagonize angiogenesis, respectively (8). VEGF is one of the major proangiogenic growth factors that is altered in progressive renal disease. VEGF is an important endothelial cell angiogenic, survival, and trophic factor (9) that is constitutively expressed in the kidney, being localized primarily to podocytes and tubular epithelial cells in the outer medulla and medullary rays (10,11). Several studies documented a loss of podocyte VEGF in glomerulosclerosis and a loss of tubular VEGF in chronic interstitial disease, such as that in chronic renal transplant rejection (12,13). Similarly, our group recently demonstrated that renal VEGF expression is also reduced in renal disease associated with aging (14) and in the remnant kidney (RK) model of progressive renal failure (8). In the latter study, the reduction of VEGF expression was correlated with decreased peritubular capillary density and with more severe interstitial fibrosis. The observation that both experimental and human progressive renal disease is associated with capillary loss and a reduction in renal VEGF expression raised the possibility that replacement of VEGF might maintain the microvasculature and thereby slow progression. In this study, we present evidence that VEGF administration in the RK model stimulates endothelial proliferation, maintains capillary density, reduces renal interstitial fibrosis, and stabilizes renal function and that these effects all occur independently of effects on systemic BP or proteinuria. All animal procedures were approved by the University of Washington Animal Care Committee. The experiments were designed to test the hypothesis that exogenous VEGF replacement would ameliorate the progressive glomerular and tubulointerstitial scarring characteristic of the RK model. The RK model was induced in male Sprague-Dawley rats (initial weight, 200 to 240 g; Simonsen, Gilroy, CA) by performing a right subcapsular nephrectomy with surgical resection of the upper and lower thirds of the left kidney. Four weeks later, rats were matched for BP, urinary protein excretion, and blood urea nitrogen (BUN) levels and were then randomized to receive either VEGF121 (50 μg/kg, subcutaneously, twice daily; n = 7) or vehicle (phosphate-buffered saline, pH 7.2; n = 6) for 4 wk. The 4-wk time point was selected for initiation of the VEGF treatment because our earlier data indicated that reduced renal VEGF expression and peritubular capillary loss were both present at that time (8). The dose of VEGF121 was based on previous studies that indicated that this dose stimulated renal angiogenesis in a rat model of the hemolytic uremic syndrome (15). At this dose, VEGF attains a peak plasma level of 50 ng/ml at 100 min after injection and is still detectable in the plasma at 5 ng/ml after 6 h. After 28 d of VEGF or vehicle administration, animals were anesthetized with xylazine and ketamine, blood samples were obtained, and the RK was collected for histologic evaluation. Twenty-four-hour urinary protein excretion was measured using the sulfosalicylic acid method. BUN and serum creatinine levels were determined using commercial kits (Sigma Diagnostics, St. Louis, MO). Systolic arterial BP was monitored with a tail cuff sphygmomanometer, using an automated system with a photoelectric sensor (IITC; Life Sciences, Woodland Hills, CA) (16). Tissue for light microscopy and immunoperoxidase staining was fixed in methyl Carnoy's solution and embedded in paraffin. Four micrometer sections were stained with the periodic acid-Schiff reagent and counterstained with hematoxylin. Indirect immunoperoxidase staining of 4-μm sections was performed as described previously (15), with the following specific antibodies: endothelial cells were detected with JG-12 (a gift of Dontscho Kerjaschki, University of Vienna, Austria) (15) or RECA-1 (a gift of Adrian Duijvestijn, University of Limberg, The Netherlands) (17); VEGF with rabbit polyclonal antibody (Santa Cruz Biotechnology, Santa Cruz, CA); TSP-1 with A6.1 (Neomarkers, Fremont, CA); osteopontin with goat antiosteopontin antibody 199 (a gift of Cecilia Giachelli, University of Washington, Seattle, WA); endothelial nitric oxide (NO) synthase with mouse anti-NO synthase III (Transduction Laboratory, Lexington, KY); and monocytes/macrophages with ED-1 (Serotec, Indianapolis, IN). Endothelial cell proliferation was identified by double-immunostaining with JG-12 and an antibody to proliferating cell nuclear antigen (PCNA) (19A2; Coulter, Hialeah, FL), as described previously (15). Control experiments included omission of the primary antibody and substitution of the primary antibody with preimmune rabbit or mouse serum. All analyses were performed in a blinded manner. Glomerulosclerosis was defined as segmental increases in the glomerular matrix, segmental collapse, obliteration of capillary lumina, and accumulation of hyaline material, often with synechial attachment to Bowman's capsule. Both the percentages of glomeruli displaying glomerulosclerosis and severity scores were measured. The latter were calculated by grading all glomeruli within a tissue section as follows: 0, no glomerulosclerosis; 1, 1 to 25% of the glomeruli exhibiting glomerulosclerosis; 2, 25 to 50% of the glomeruli exhibiting glomerulosclerosis; 3, 50 to 75% of the glomeruli exhibiting glomerulosclerosis; 4, 75 to 100% of the glomeruli exhibiting glomerulosclerosis. Tubulointerstitial injury and interstitial fibrosis were evaluated by measuring the amount of tubular osteopontin expression and interstitial type III collagen deposition, respectively, by computer image analysis (Optimas 6.2; Media Cybernetics, Silver Springs, MD), as described previously (8, 18). The mean numbers of infiltrating glomerular and interstitial macrophages (ED-1-positive cells) were calculated by averaging the total numbers of positive cells in at least 40 glomeruli or 30 sequentially selected, 0.25-mm2 grids at ×200 magnification, respectively. Changes in endothelial density and morphologic staining were evaluated by immunostaining with JG-12 (15) and were confirmed with RECA-1, which is an antibody to a different endothelial antigen (17). The number of glomerular capillary loops per glomerular across-section, as identified by positive JG-12 staining, was counted in all glomeruli of tissue sections, at ×400 magnification. Glomerular capillary density was defined as the number of capillaries per glomerular cross-sectional area (per 0.01 mm2); the latter was determined by computer image analysis. Peritubular capillary density was quantified and expressed as the percentage area identified by positive JG-12 staining in 100 cortical tubules, to account for changes in tubular size. A peritubular capillary rarefaction index was also measured as described (8,9). The mean numbers of proliferating endothelial cells (JG-12- and PCNA-positive cells) in each glomerular cross-section and in 0.25-mm2 grids of tubulointerstitial areas at ×200 magnification were measured by using the entire kidney section. The renal expression of VEGF in the cortex and outer medulla was measured by quantifying the percentage area of VEGF immunostaining by computer image analysis. Glomerular and periglomerular TSP-1 expression was graded by counting the percentage of positive glomeruli or glomeruli that were surrounded by TSP-1 staining. Tubulointerstitial TSP-1 expression was quantified by counting the number of tubules with positive TSP-1 staining in 40 sequentially selected, 1-mm2 grids at ×100 magnification and summing the values. The concentrations of urinary nitrate (NO3-) and nitrite (NO2-) were measured in a two-step process. The first step involved the conversion of NO3- to NO2-, using nitrate reductase, and the second step was the addition of the Griess reagent (Clontech, Palo Alto, CA), which is a mixture of sulfonic acid and N-(1-naphthyl)ethylenediamine. Optical density values were measured by spectrophotometry. All data are presented as mean ± SD. Differences in the various parameters between the VEGF-treated group and the vehicle-treated group were evaluated by unpaired comparisons for nonparametric data. Differences in parameters at each time point after RK surgery were compared by paired t test. The relationships between variables were assessed by Pearson correlation analysis. Significance was defined as P < 0.05. The RK model was induced by using the “polectomy” version, in which the subtotal nephrectomy is performed by surgical resection of renal tissue, rather than infarction. The polectomy version results in less systemic hypertension (19), thus minimizing the effects of hypertension on the microvasculature. In addition, by surgically removing the poles, we could indirectly measure the amount of residual kidney tissue left in place (Table 1). Four weeks after surgery, rats were randomly assigned to receive VEGF121 or vehicle for 1 mo (i.e., 4 to 8 wk after RK surgery). The VEGF was tolerated well, and rats gained weight equivalently, compared with vehicle-treated control animals (Table 1). Although the final RK weight tended to be higher in the vehicle-treated group, this trend was not statistically significant. Similarly, the RK weight/body weight ratios and the percentage increases in RK weight were not different between the VEGF- and vehicle-treated RK rats (Table 1). Systolic BP increased gradually between 4 and 8 wk in vehicle-treated animals, resulting in a mean systolic BP of 164.9 ± 5.2 mmHg at week 8. VEGF administration did not affect systolic BP in the RK rats (Figure 1). There was also no significant difference in urinary protein excretion between VEGF- and vehicle-treated RK rats at week 8 (118 ± 35 versus 124 ± 39 mg/d, VEGF versus vehicle, P = NS). Changes in systolic BP during vascular endothelial growth factor (VEGF)/vehicle administration in the remnant kidney (RK) model. During the period of VEGF/vehicle administration, there was a gradual increase in BP in both VEGF- and vehicle-treated RK rats. At all time points of VEGF/vehicle administration, there were no differences in BP between these two groups. Data are expressed as mean ± SD. In contrast to the lack of effect of VEGF on BP and urinary protein excretion, VEGF treatment stabilized renal function, as reflected by BUN levels (Figure 2). BUN levels remained remarkably constant, at approximately 70 mg/dl, in the VEGF-treated rats with up to 4 wk of VEGF administration, whereas vehicle-treated rats exhibited significant 50 to 60% increases in BUN levels within 2 wk. Two of the vehicle-treated rats with the most impaired renal function (premortality BUN levels of 119 and 149 mg/dl) died during the 4-wk treatment period, which likely accounts for the lack of statistical significance (P = 0.06) for the difference in BUN levels between the two groups at the final time point in the study. In contrast, all VEGF-treated rats survived. Changes in blood urea nitrogen (BUN) levels during VEGF/vehicle administration in the RK model. 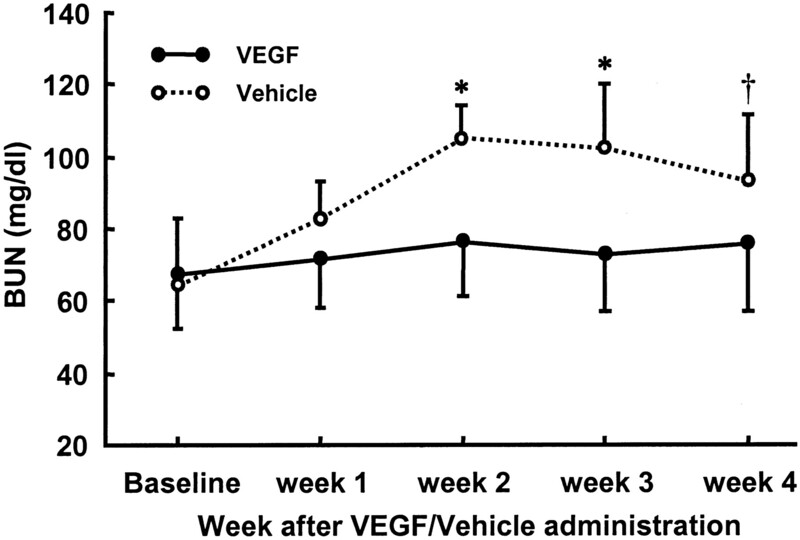 BUN levels remained remarkably constant in the VEGF-treated rats during the 4 wk of VEGF administration, whereas vehicle-treated rats exhibited a significant increase in BUN levels within 2 wk. Two vehicle-treated rats with the most impaired renal function (premortality BUN levels of 119 and 149 mg/dl) died during the 4-wk period. Data are expressed as mean ± SD (*, P < 0.05 versus VEGF-treated group; †, P = 0.06 versus VEGF-treated group). A similar trend was observed when serum creatinine levels were measured. 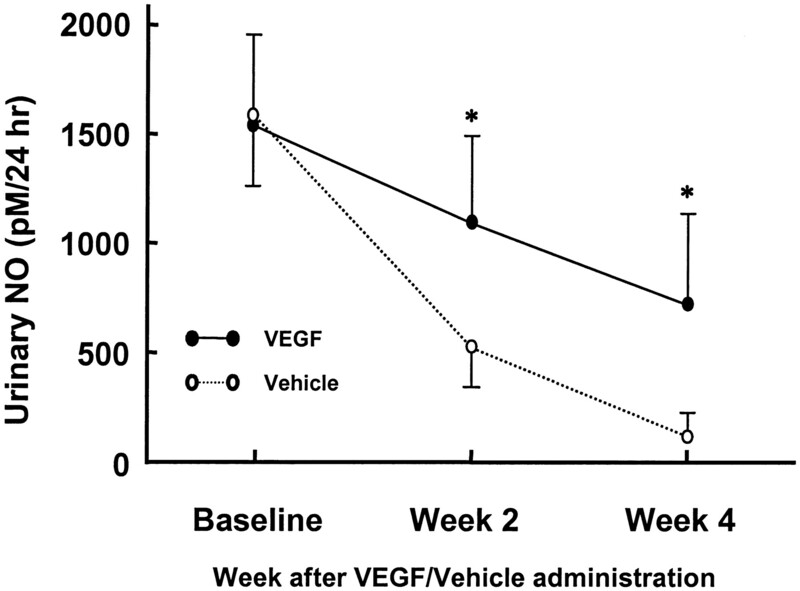 Baseline serum creatinine levels were equivalent for VEGF- and vehicle-treated rats (1.18 ± 0.3 versus 1.20 ± 0.2 mg/dl, VEGF versus vehicle, P = NS). At 3 wk, serum creatinine levels tended to be less in the VEGF-treated animals (1.37 ± 0.4 versus 1.80 ± 0.5 mg/dl, VEGF versus vehicle, P = 0.07). This trend was also observed at the time of euthanasia, despite the death of two of the control animals as a result of renal failure (1.38 versus 1.50 mg/dl, VEGF versus vehicle, P = NS). Effects on Glomerular Capillaries. The RK model is known to be associated with glomerular hypertrophy, which is manifested by an early increase in glomerular tuft diameter and an acute increase in glomerular capillary loop number. However, with time there is both a decrease in glomerular capillary density and a decrease in the absolute number of glomerular capillary loops per glomerular cross-section (8). As shown in Table 2, VEGF treatment did not affect glomerular hypertrophy, as reflected by the glomerular surface area. However, VEGF-treated rats exhibited preservation of the glomerular capillary endothelium, compared with vehicle-treated control animals (Table 2). Both the absolute number of glomerular capillary loops and the glomerular capillary density (which corrects for changes in glomerular size) were significantly greater in VEGF-treated rats. The preservation of glomerular capillaries in VEGF-treated rats was associated with a dramatic 3.5-fold increase in the number of proliferating glomerular endothelial cells (0.136 ± 0.030 versus 0.039 ± 0.019 cells/glomerular cross-section, VEGF versus vehicle, P < 0.05; Figure 3A). The number of glomerular capillary loops was inversely correlated with the BUN levels for individual RK rats (r2 = -0.59, P < 0.05; Figure 3B). Comparison of proliferating cell nuclear antigen (PCNA)-positive endothelial cells and the relationship between glomerular capillary number and renal function in VEGF/vehicle-treated RK rats. Double-immunolabeling documented an increase in proliferating glomerular endothelial cells (JG12-positive/PCNA-positive), as well as proliferating peritubular capillary endothelial cells (JG12-positive/PCNA-positive), in VEGF-treated RK rats, compared with vehicle-treated RK rats (A). There was a significant inverse correlation between the number of glomerular capillary loops and BUN levels in the RK rats (B). Data are expressed as mean ± SD (*, P < 0.05 versus vehicle-treated group). GEC, glomerular endothelial cells; PTCEC, peritubular capillary endothelial cells. Patterns of peritubular capillary changes in the RK model. Four major patterns of peritubular capillary staining were observed in VEGF- and vehicle-treated RK rats. (A) A normal peritubular capillary pattern, with lacy capillary staining around normal tubules, could be observed. (B) Decreased peritubular capillary staining in association with tubular dilation and peritubular fibrosis could be observed. (C) Some peritubular capillary rarefaction was also observed at sites with minimal evidence of severe tubular damage. (D) In some cases there was tubular atrophy and fibrosis, with condensation of the peritubular capillaries (pseudoangiogenesis). 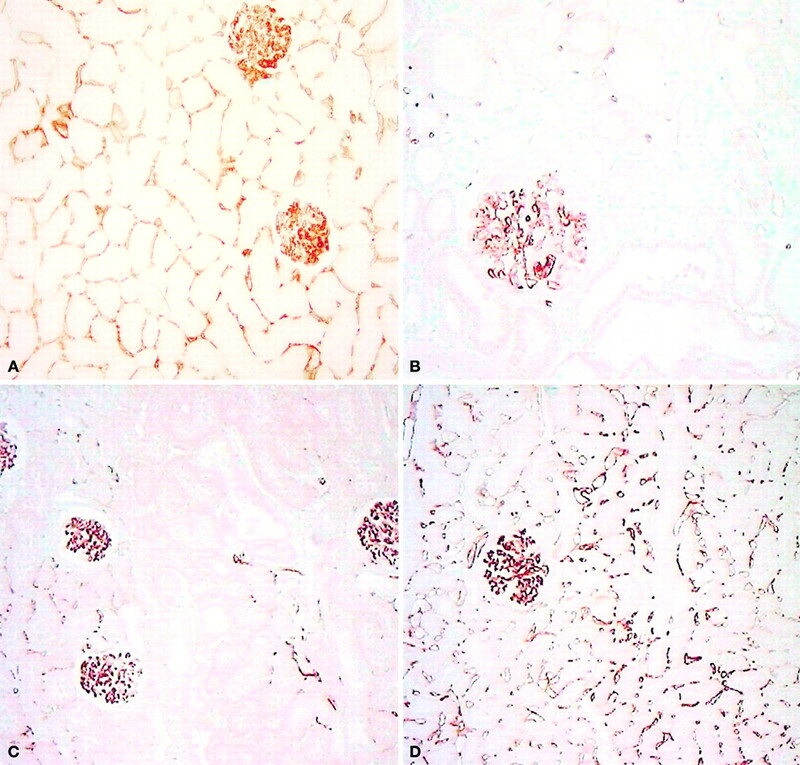 Endothelial cells were stained with JG-12 using indirect immunoperoxidase techniques. Magnifications: × 100 in A, C, and D; × 200 in B.
VEGF-treated rats also displayed the same four capillary staining patterns. The primary effect of VEGF was to improve capillary density in areas where tubular morphologic features were relatively well preserved; overall, there seemed to be little benefit in areas where there was already established fibrosis and marked tubular atrophy. There was also no difference in the percentage area with the pseudoangiogenesis pattern (4.3 ± 2.2 versus 4.0 ± 2.4%, VEGF versus vehicle, P = NS). Importantly, when measurements of capillary density that corrected for changes in tubular size were performed, VEGF-treated rats exhibited a twofold greater overall capillary density (percent positive area of peritubular capillary staining per 100 tubules); similarly, the peritubular capillary rarefaction index was threefold less (Table 2). This finding was consistent with a twofold increase in peritubular capillary endothelial cell proliferation in VEGF-treated rats, compared with control animals (1.60 ± 0.30 versus 0.78 ± 0.17 cells/mm2, VEGF versus vehicle, P < 0.05) (Figure 3A). These studies thus confirm that VEGF treatment was associated with increased proliferation and preservation of the peritubular capillary endothelium. Overall Time Course of the Effects of VEGF on the Renal Microvasculature. Figure 5 presents the overall time course of renal microvascular loss in the RK model, for both vehicle- and VEGF-treated rats. VEGF administration for 4 wk maintained the glomerular capillary loop number in RK rats (Figure 5A). In contrast, the capillary loop number progressively decreased in vehicle-treated control animals >4 wk after renal mass reduction. VEGF also protected animals from peritubular capillary loss (Figure 5B). As mentioned before, vehicle-treated rats demonstrated progressive capillary loss; however, this peritubular capillary loss was prevented in the VEGF-treated rats. Overall time course of renal microvascular changes in VEGF/vehicle-treated RK rats. VEGF administration maintained the glomerular capillary loop number (A) and prevented progressive peritubular capillary rarefaction (B) in the RK rats. Data for the time points of 0 wk and 4 wk are from the previous descriptive study (8). Data are expressed as mean ± SD. Although there was preservation of capillary loops in the VEGF-treated rats, there was no significant effect of VEGF on either the frequency (11.7 ± 4.6 versus 12.8 ± 3.6%, VEGF versus vehicle; P = NS) or the severity (scores of 0.67 ± 0.42 versus 1.22 ± 0.63, VEGF versus vehicle; range, 0 to 4; P = NS) of glomerulosclerosis. Tubulointerstitial fibrosis, measured as the percentage area of the kidney with type III collagen deposition, was reduced twofold in VEGF-treated animals (9.32 ± 3.3 versus 17.45 ± 7.5%, VEGF versus vehicle; P < 0.05; Figure 6). Osteopontin expression by tubules, which has been observed to be correlated with the development of fibrosis (20,21), was also significantly reduced by VEGF treatment (5.57 ± 1.60 versus 9.58 ± 3.45%, VEGF versus vehicle; P < 0.05; Figure 7). Collagen type III deposition in VEGF/vehicle-treated RK rats. Collagen type IIII deposition in tubulointerstitial areas was much more pronounced in vehicle-treated rats (B), compared with the VEGF-treated group (A). 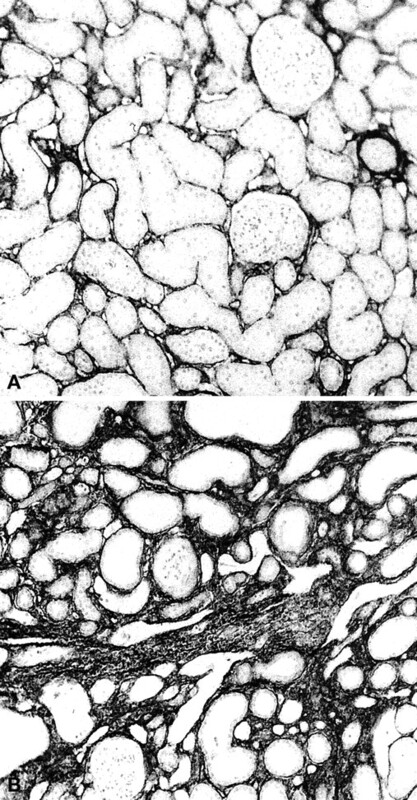 Magnifications: ×200 in A; ×100 in B.
Osteopontin expression in VEGF/vehicle-treated RK rats. Osteopontin immunostaining in cortical tubules (arrows) was decreased in VEGF-treated RK rats (A), compared with vehicle-treated control animals (B). 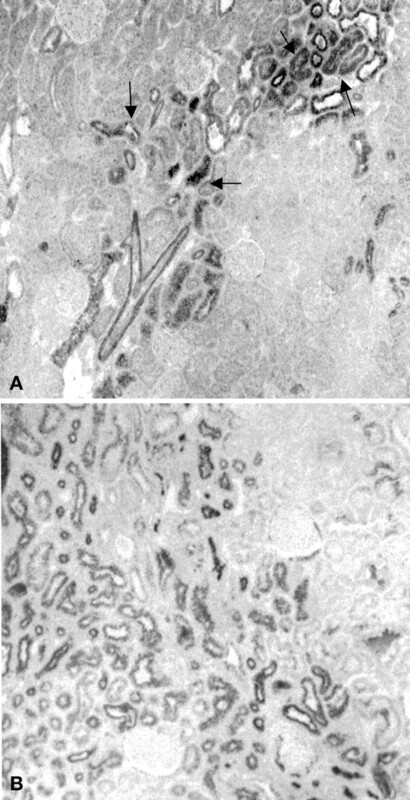 Magnifications: ×40 in A and B.
VEGF administration did not alter the macrophage infiltration in glomeruli (5.2 ± 1.4 versus 5.6 ± 2.0 cells/glomerular cross-section, VEGF versus vehicle; P = NS) or in tubulointerstitial areas (149 ± 44 versus 152 ± 39 cells/mm2, VEGF versus vehicle; P = NS). There were no significant differences in VEGF expression (4.1 ± 2.0 versus 3.2 ± 1.7% positive area, VEGF versus vehicle; P = NS) or TSP-1 expression (glomerular TSP-1, 50.8 ± 10.9 versus 58.9 ± 15.3%; tubular TSP-1, 14.3 ± 1.2 versus 13.8 ± 1.0 tubules/mm2; P = NS), as assessed by immuno-histochemical staining, between VEGF- and vehicle-treated RK rats during the course of the experiment. The angiogenic action of VEGF is known to be mediated by stimulation of endothelial cell NO production (22). We therefore examined the renal expression of endothelial NO synthase and the urinary excretion of nitrates/nitrites. VEGF-treated rats exhibited significantly greater (twofold) renal endothelial NO synthase immunostaining (13.4 ± 2.6 versus 7.6 ± 2.0%, VEGF versus vehicle, P < 0.05; Figure 8), as well as higher (eightfold) 24-h urinary nitrite and nitrate levels at weeks 2 and 4 after VEGF or vehicle administration (Figure 9). However, these urinary nitrite levels for both groups of RK rats were significantly less than those observed for age- and body weight-matched normal rats (mean ± SD, 5350 ± 850 pM/24 h). Endothelial nitric oxide (NO) synthase expression in VEGF/vehicle-treated RK rats. There was a dramatic loss of endothelial NO synthase expression in glomerular and peritubular capillaries in vehicle-treated rats (B), compared with the VEGF-treated group (A). Magnification, ×100 in A and B. Changes in urinary nitrite/nitrate levels during VEGF/vehicle administration. During the course of the RK model study, urinary nitrite/nitrate excretion continuously decreased. The urinary nitrite/nitrate levels were higher in the VEGF-treated group at each time point and demonstrated an eightfold increase in the VEGF-treated group with 4 wk of VEGF administration, compared with vehicle-treated rats. Data are expressed as mean ± SD (*, P < 0.05 versus vehicle). There are limited data available regarding the role of the microvascular endothelium in progressive renal failure. It has been recognized that there is a loss of both glomerular and peritubular capillaries in experimental and human progressive renal disease (3,7), and recent studies have documented that this loss is attributable to both accelerated endothelial cell loss and impaired capillary repair (5,6). However, it is not known whether endothelial loss is a primary or secondary event in the scarring process or whether the progression of renal disease can be slowed by measures that maintain the microvascular endothelium. Recent studies by our group and others have suggested that the endothelial loss in the RK model may be at least partly mediated by a decrease in the constitutive expression of VEGF by glomerular podocytes and tubules, a process we have linked to proteinuria and macrophage infiltration (8). We therefore examined the hypothesis that the administration of exogenous VEGF could slow progression in the RK model. The action of VEGF is primarily on endothelial cells, and the receptors for VEGF (flt-1 and kinase domain region) have been detected on the microvascular endothelium within the kidney (20). VEGF stimulates endothelial cell proliferation (21) and promotes endothelial cell survival in response to a variety of mediators (9,23), and these actions are mediated by the stimulation of NO production by endothelial cells (22). We used VEGF121, which does not bind heparin and can therefore be administered subcutaneously, with the attainment of therapeutic blood levels, at a dose that stimulates renal microvascular endothelial cell proliferation in a rat model of the hemolytic uremic syndrome (15). VEGF administration was initiated at 4 wk, at which time there was documented microvascular endothelial cell loss and decreased constitutive expression of VEGF (8). VEGF was administered for 4 wk and was well tolerated. Interestingly, VEGF had no effect on systemic BP or proteinuria, which are the two most important parameters predictive of progression in both human and experimental studies (24, 25). Despite the lack of effect on BP or proteinuria, VEGF treatment significantly prevented renal function deterioration and reduced renal scarring. 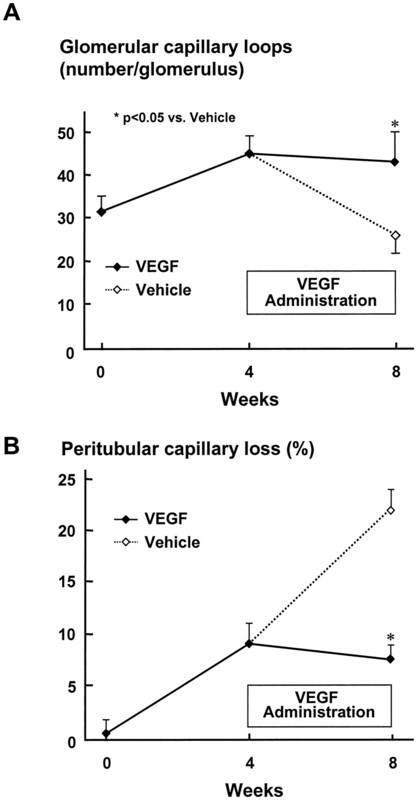 A principal effect of VEGF was maintenance of the glomerular capillary endothelium. Although there was no effect on glomerular hypertrophy, the absolute glomerular capillary loop number and glomerular capillary density were maintained, and this was associated with a significant increase in glomerular endothelial cell proliferation. The higher glomerular capillary loop number in the VEGF-treated group may explain the preservation of GFR, as a consequence of the maintenance of or increases in the glomerular surface area available for filtration (and hence the ultrafiltration coefficient). In contrast, VEGF treatment had no effect on proteinuria, suggesting that intraglomerular hypertension and increased permeability to protein were not prevented. This latter observation may explain why mesangial cell and podocyte injury and the frequency of glomerulosclerosis were unaffected. It will be important to perform micropuncture studies to clarify these observations. Nevertheless, this study suggests a novel mechanism for the preservation of glomeruli, i.e., maintaining the number of normal capillary loops, as opposed to preventing the segmental loss of capillaries resulting from the development of glomerulosclerosis. We also evaluated the effect of VEGF on the peritubular capillary endothelium. Whereas capillary loss was prominent in the vehicle-treated rats, remarkable protection was observed for the VEGF-treated animals, with threefold less capillary rarefaction and a twofold increase in capillary density. Although some of the effects of VEGF may be to prevent endothelial cell apoptosis in response to injurious factors such as TNF-α (Suga S, Kim Y-G, Joly A, Pucharz E, Kang D-H, Jefferson JA, Hughes J, Abraham JA, Johnson RJ, manuscript submitted), we also documented a twofold increase in peritubular capillary endothelial cell proliferation in the VEGF-treated rats. The observation that renal endothelial NO synthase expression and urinary nitrite excretion were increased in VEGF-treated animals is also consistent with a biologic effect of VEGF on the endothelium, because VEGF stimulation of NO production is intricately involved in VEGF-mediated angiogenesis (22). It is likely that the maintenance of the peritubular capillary network is responsible for the observed reduction in interstitial fibrosis. Hypoxia is a stimulus for proliferation, osteopontin expression, transforming growth factor-β synthesis, and collagen production by tubular cells (4, 26). The observation that VEGF administration had only a partial effect in reducing fibrosis may be attributable to the continued presence of other injurious factors that were not altered by the VEGF therapy, including systemic hypertension, proteinuria, local macrophage infiltration, and hormonal and cytokine responses to renal ablation (27). Although it seems that the beneficial effects of VEGF on renal disease in the RK model are attributable to its effects on the endothelium, it is possible that VEGF could be acting via other mechanisms. For example, VEGF could reduce glomerular hydrostatic pressure via its ability to stimulate NO production. Anderson et al. (28) reported that reduction of glomerular pressure slows progression independently of systemic BP. However, a reduction in glomerular pressure would likely be associated with a reduction in proteinuria (28), which was not observed in our study. It is also possible that VEGF could be interacting with other cell types in the kidney. However, most studies have found VEGF receptors to be exclusively expressed by endothelial cells in the adult kidney, although a few reports have indicated that mesangial cells and tubular cells may express VEGF receptors under rare conditions (29, 30). Therefore, we cannot entirely exclude a non-endothelial cell effect of VEGF. Interestingly, we could not demonstrate an effect of VEGF administration on endogenous VEGF expression in rats with RK (this study) or in normal rats (data not shown). In conclusion, VEGF treatment significantly stabilized renal function and diminished renal scarring in the rat RK model. This beneficial effect of VEGF seemed to be mediated by preservation of the glomerular and peritubular capillary endothelium and was associated with partial reversal of the impaired angiogenesis that we have documented in this model. This effect was independent of BP, proteinuria, and local macrophage infiltration, which are three of the most important known mediators of progression. This study suggests that the use of VEGF or other potent angiogenic factors may represent a novel therapeutic strategy to combat progressive renal disease. Support for this manuscript was provided by United States Public Health Service Grants DK43422, DK47659, and DK52121. D.-H.K. is the recipient of an International Society of Nephrology Fellowship Award, a grant from the Alumni Association of Ewha Woman's University College of Medicine, and a postdoctoral fellowship grant from the Korean Science and Engineering Foundation. Vascular Endothelial Growth Factor Therapy for the Kidney: Are We There Yet? Protecting the Microvasculature: A Tie-ght Connection to Ameliorating Chronic Kidney Disease?